There are many attractive credit card-sized compacts jostling for market share, so what makes the DMC-FX01 special? Easy: the inclusion of 28mm wide-angle Leica optics makes it useful for group photos; its 6-megapixel resolution is adequate for poster-sized prints; and an ISO 1600-equivalent High Sensitivity mode for lowlight shooting without fl ash suggests a desire to compete with the likes of Fujifilm. But perhaps the real trick up its sleeve is the inclusion of optical image stabilisation - or Mega OIS, something that just might help banish camera shake. After last year's race for larger screen sizes, it seems the ability to shoot in low light without flash or a tripod's the new battleground. Given the camera's overall dimensions, the 2.5-inch LCD with a better-than-average 207,000- pixel resolution is more than sufficient to compose and review shots. A High Angle mode increases screen visibility when taking awkward shots over the heads of crowds, while overall brightness can be boosted via the Power LCD function. Both work well; the screen's bright and clear, and you barely notice the lack of an optical viewfinder. Speed of operation is impressive. The DMCFX01 takes around a second to power up, and there's barely a blink between shots at the highest resolution. A 3fps Continuous mode is the equal of some DSLRs, while shutter delay's slight - the official blurb puts it at 0.005 of a second. 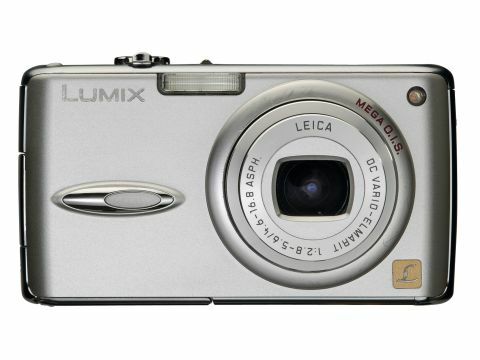 The metal build ensures the camera feels sturdy, although the DMCFX01' s intuitive controls and function buttons have been slightly compromised by that large LCD. Apart from the zoom rocker, which ergonomically encircles the shutter button, controls require fingertip operation. The DMC-FX01's battery life is very good. Using the camera intermittently over a fortnight, there was no visible drop in performance levels. The two image stabilisation settings - one continuous, the other manually selectable - work well. Although it's not a total cure for image blur, it proved up to the job of photographing my hyperactive niece under natural light indoors. Also useful for those with young children - or very soft skin - is the Baby setting, hidden away among the 16 Scene modes on offer. Despite some features found in more enthusiast-orientated cameras, the DMC-FX01 reveals its something-for-everyone ethos by including a Simple mode. Indicated by a heart icon, this pares functionality down to the basics; indicating, for example, settings that will achieve suitable print or email sizes rather than confusing beginners with pixel counts. This consideration for how the end image will be displayed extends to the fact that users can choose between aspect ratios of 4:3 (the default), 3:2, or a widescreen 16:9 for stills, while video clips (here the now-standard 30fps at 640x480 pixels in 4:3 ratio) also benefit from that cinematic look, with a resultant hike in resolution to 848x480 pixels. Despite being yet another point-and-shoot camera, the DMC-FX01's performance outclasses its competitors and it's hard to fault. Displaying an even colour balance - not too warm, not too cold - images are realistically and sharply rendered, while difficult metering situations such as bright spring sunlight still produced an even exposure. Image noise is also handled well - invisible in interior shots when viewed at 100% at ISO 800 and visible only to an expert at ISO 1600.